We feature hundreds of items, all customer requested, from local and artisanal food vendors. Tacodeli breakfast tacos? We have them. Wine enthusiasts can enjoy our lovely selection of wines, hand-selected from the finest boutique vineyards. 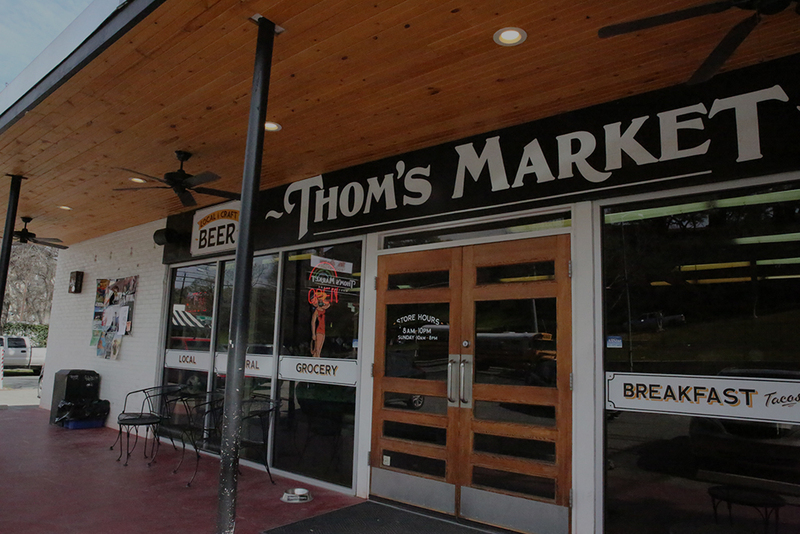 If you prefer hops, we also carry a spread of Austin-based craft beers. 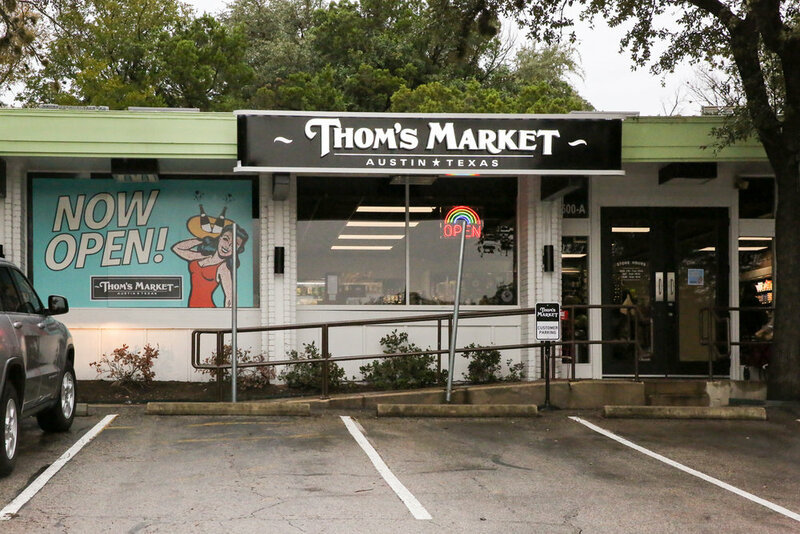 Thom’s Market was inspired after a year-long sailing trip with my family provisioning our boat with fresh groceries required hiking to local stores wherever we anchored. I soon realized old-school grocery stores, like my grandfather's, had mostly vanished. It led me to wonder if a local neighborhood market featuring fresh food could work in Austin. Each location features a variety of outdoor gear including sunglasses, hats, beach towels, frisbees and sunscreen. Perfect for trips to Zilker Park or Barton Springs. Need a cool gift? Look no further for fun socks, toys, greeting cards and candles. Please stop in and say howdy! Mineral rich water from Texas limestone country. Small batch jams made from locally sourced ingredients. Artisanal coffee roasted from sustainable farming. Austin’s version of what a pool-sipping lager should be. Texas winemaker Rae Wilson’s “love letter to Texas” is a rosé with subtle aromatics of strawberry and stone fruit. Not only do these candles smell amazing, they burn for a long time too. Creamy cashew paired with chocolate, no refined sugars here! Cold brew with MCT to give your brain a boost. Gluten free cookies perfect for after your workout. The iconic Austin porter after spending some magical time in whiskey barrels. One of the most highly rated coffee stouts on the market, and at 12% ABV, this is no slouch. A light, Oak-smoked beer that is perfect for pairing with Texas barbecue. Smells and looks like a glass of orange juice, but no added oranges. A Belgian Black IPA brewed with coffee to round out the nicely hopped and malty body. A cabernet sauvignon that marries traditional California wine with old world Bordeaux. Pair this approachable wine with BBQ, pizza or your favorite hearty dish. New Zealand winemaker Jules Taylor brings to us vivacious tropical fruits, passion fruit that bursts from the glass and zingy accents of kaffier lime. A fine, delicate drink for the Texas heat. Natural wine at it's best. La Clarine Farms creates small batches of wine based on biodynamic principles. The result is a light bodied piedi grandi, both savory and herbal with a touch of acidity. Whether it's a relaxing day at the park, or an impromptu gathering amongst friends, Essentially Geared Wine offers a delicious chardonnay in a can. A versatile pinot noir from the Willamette Valley with hints of cola, root beer, stewed fruit, and blackberry jelly.